In late February, 2015, members of the Georgia O’Keeffe Museum staff went out to West Texas to conduct serious research; collecting oral histories from people who grew up hearing first-hand stories of O’Keeffe, tracking locations from photo archives, following leads on addresses that O’Keeffe may have lived and visited. Serious research into a period long overlooked about O’Keeffe’s life as a teacher in Amarillo and Canyon. These people aren’t dressed for a hike, they’re partying! Just look at those leather gloves; who’s going to climb a rock in those? It even looks like the man standing in the middle of the pack is holding a drink in his right hand. 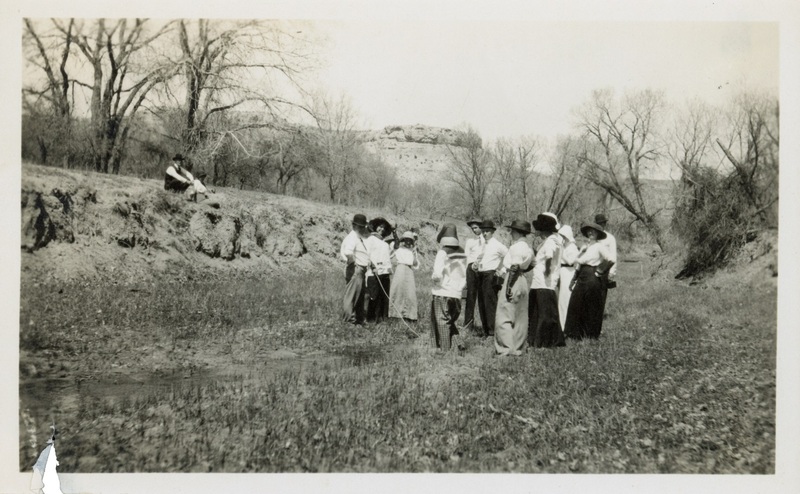 Sure enough, during the research trip to West Texas, the museum team stopped by the Palo Duro Canyon and found that it is populated, to this day, by a community of fun loving people. The Palo Duro Club was established in the early 20th century in 1905, a collection of homes on private property at the head ofthe Palo Duro Canyon. Here, families could get away from the heat in Amarillo for weekend trips or for vacation. 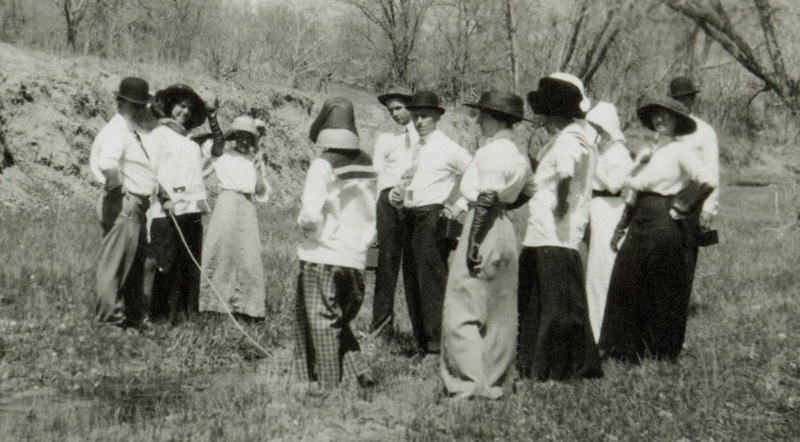 During her time in Amarillo and Canyon, TX, Georgia O’Keeffe visited the Palo Duro Club with her students, friends and their extended families. Today, the Club is a small but vital community of people who—still—love to party. As the museum staff toured the Club with aGoPro Camera capturing everything they could for research’s sake, they were shown the barbeque pit with the smoke stack, the picnic area where the weddings are held, and, importantly, the Spring House, one of the first structure built on the property,where the above picture of O’Keeffe may have been taken. Pattilou Dawkins, whose grandfather along with his brother and two other friends established the club and built one of the first houses was the Museum team’s gracious tour guide for the trip through the Canyon; she described the meaning of the Spring House in her life: “Oh yeah, [that’s] were the parties were because it was down by the spring where they could use that water.” Dawkins was even kind enough to show the team where the Spring House was; where that photo may have been taken. 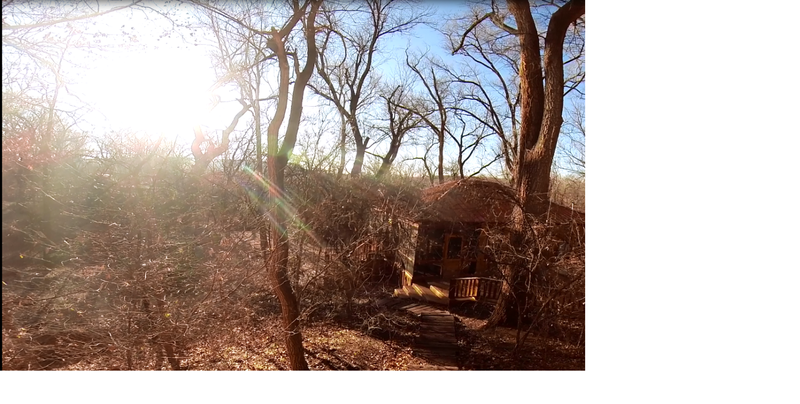 It’s a little more wooded…But what do you think: Could this be where the photo was taken? March 27, 2015 in Research Center.